The condition known as adenomyosis will be discussed on this page. The information supplied should not be used to diagnosed nor to treat the condition. The causes of pelvic pain and abnormal menstruations should always be investigated, diagnosed and treated in consultation with a qualified medical practitioner. Adenomyosis is a type of endometriosis (the lining [endometrium] of the womb) is growing in an abnormal location. In the case of adenomeiosis the endometrium infiltrates the womb's muscle. The next drawing will explain. 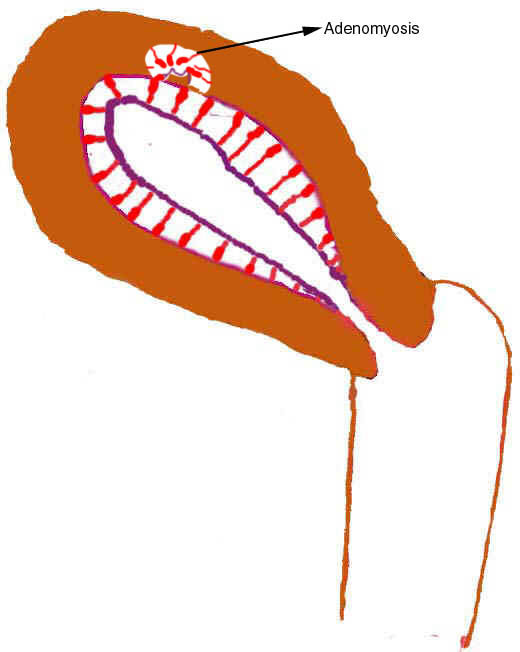 The drawing illustrate only one area where the endomtrium infiltrates the muscle. It can however happen in many areas. These lesions menstruate but the blood are trapped between the muscle fibers causing pain and uterine enlargement ( the womb becomes bigger). Adenomeiosis is an important cause of pelvic pain. (iii)An enlarged uterus causing discomfort. It is a difficult diagnosis and other conditions can cause similar symptoms. It is a type of endometriosis. Compare it with endometriosis.